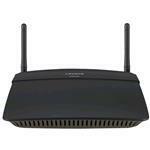 The Linksys AC1200 Dual Band SMART Wi-Fi Router (EA6100) offers fast,reliable Wireless-AC technology. With speeds up to 2.8X faster than Wireless-N,the Linksys AC1200 Router is perfect for homes with multiple connected devices. It comes standard with 4 Fast Ethernet Ports,a USB 2.0 port and Linksys SMART Wi-Fi software allowing you to monitor and control your network from anywhere. Storage features for external USB hard disk and flash drives include user/group share management,file sharing via Samba and FTP server functionality supporting Unicode encoding.